Do you need to add a few extra holes to a belt, or dog collar? Do you like using leather in crafts or scrapbooking? If you answered yes, a leather hole punch is a great, rugged tool to have. It is important to note that there are many more uses than just what I mentioned above. HINT: To keep the blades sharp, fold a sheet of aluminum foil so it is 4 sheets thick and punch about 20 holes in it with each sized punch. Repeat if necessary. Below I review the four top models and what makes them the best. 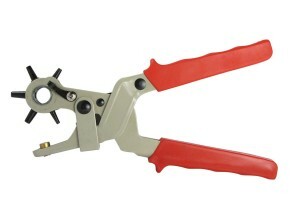 Built by Skilled Crafter this ergonomic hole punch, has nice big comfortable handles. The manufacturer states that you will no longer have hand or wrist strain if you use this model. Because of the lever action of the double handles, it is much easier to squeeze. A nice feature of this model is an extra large strike plate that makes the punches more stable. 6 punch sizes are included on the adjustable head ranging from 2mm to 4.5mm holes. A nice touch, is with this model you get 2 additional strike plates, a marking guide to use on your leather, a ruler, also a nifty tool that cleans out the punch holes, and cutting tubes. Last but not least you get a carrying case for the accessories and a two year extended warranty. Built by EvZ this model has six round tubes that have a range of sizes. However, EvZ also sells models that can make oval and flat cuts if you are looking to make specific designs. This reviewed model utilizes a strong metal body that will last for a long time. Which is important if you plan on using your punch a lot! A small concern but it is worth noting that the head only rotates in one direction. And before using make sure that it is locked in place. Also because the punch works easier than you might expect it is important to not squeeze too hard, and use a piece of sacrifical cloth like denim to protect the strike plate. 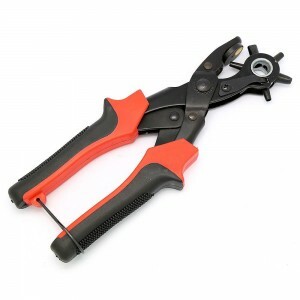 Built by Pro-Master this hole punch also has six sizes that you can choose from, but only round holes can be made. That is generally not a big deal if you are just looking to add a few holes to a belt, or dog collar. 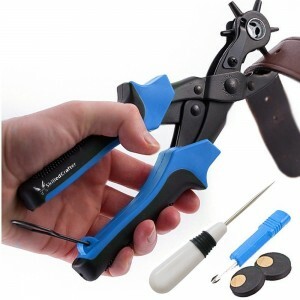 A nice addition, that the other reviewed models do not include is an eyelet setting pliers, and 100 eyelets/grommets. This extra bonus is great for craft and sewing projects. Two extra punch plates and a 3 year warranty are also included with this model. This hole puncher by SE is a great value model, and still a rugged punch. The handles are generally less comfortable than the previously reviewed models, but it still gets the job done. This nine-inch long model has 6 hole sizes that you can punch. The adjustable head adjusts into place with a satisfying click. I do not recommend this model if you plan to use it on extra thick leather. 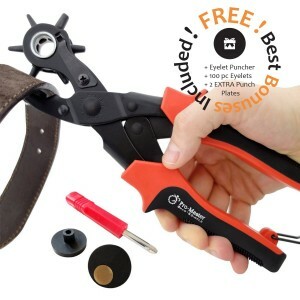 You do not get extra punch plates or accessories with this model, just a good solid leather hole punch.